In the late 1980s a fight broke out between System Enhancement Associates (SEA), maker of the ARC program, and PKWARE (Phil Katz Software) over the rights of a program named ARC (or PKARC). It quickly expanded into one of the largest controversies the BBS world ever saw. The SEA (System Enhancement Associates) vs. PKWARE (Phil Katz Software) legal case changed the landscape of the BBS forever, bringing in laws, trademark/copyright protection, and intellectual property issues to the forefront of the culture. Because of the wide-spread network of Fidonet, the information about the case was spread far and wide, and the memories of the event are long in many minds, even if all the details are fuzzy. The major players were Thom Henderson of SEA, and Phil Katz of PKWARE. While others were involved (in the case of folks like Andy Foray, quite intimately), the lines were soon drawn as Henderson vs. Katz. Thom Henderson had previously been known for his work with Fidonet, including organizing the IFNA (International Fidonet Association) and being an editor of FidoNews. The controversy raged around a program called ARC, released around 1985, which would compress and store groups of files as one file, making it easier and quicker to download programs and support files at once off of BBSes. This archiving software was written at SEA, and the source code was freely available. Because of the ease of use and availability of this program, it quickly became the defacto standard for file archives on Intel-based IBM machines. What happened next was disputed by various parties (and the many versions and debates are covered in the files below), but the upshot was that Phil Katz released PKARC, a faster version of ARC with assembler routines. In April of 1988, SEA sued Phil Katz and PKWARE for trademark violation, use of the ARC "look and feel", and direct lifting of ARC code. This was one of the first times that a member of the BBS community sued another member, and it was certainly the most publicized and covered of any up to that time (and years beyond). The debate that raged over this event spread to many parts of Fidonet and on all sorts of online services, such as Compuserve. Calls were made for protests, petitions, renaming of .ARC files to .SUE, and blatant violation of SEA's claims to ownership with the intention of bankrupting the company in legal fees. Ironically, Henderson's own work in architecting and improving Fidonet were used against him as the network spread more debates, contentions, and rumor regarding the legal case than he could reasonably expect to respond to. 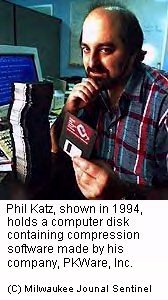 During this time, Phil Katz created a new compression program, which was named for him by his friend Bob Mahoney (sysop of EXEC-PC BBS), who suggested "ZIP", because (according to a phone conversation between Jason Scott and Mr. Mahoney), it implied speed ("zippy") and sexiness ("zipper"). The name stuck, and PKZIP became the standard for compression on PCs and other platforms. Ultimately, SEA was sold to a Japanese Company in 1992 and Henderson moved back to Virginia. The .ARC format fell out of favor and succumbed to .ZIP, which persists to the present day. Tragically, Phil Katz was found dead in a hotel room in April of 2000, having died from alcohol-related poisoning. A very large thank-you goes to Bruce Wilson for tracking down and sending a couple dozen files (available below and elsewhere) related to the case.